If you are on a diet this recipe is for you! I made this last night for my hubby because he is trying to get in shape/loss weight, and honestly you would never guess that this recipe is suppose to be light on calories. One serving, or one prepared chicken breast, is equal to 358 calories. The only thing I didn’t like about this recipe is that the bread crumbs never got crisp for me. So if I were to make this again, I either wouldn’t have covered with foil the first 20 minutes of baking, or I would have broiled the chicken before adding the tomato mix on top. The flavor is still really good either way, but I just thought the texture overall would have been better if the breading came off toasted, like the toasted french bread original served with bruschetta. Preheat oven to 375 degrees. Place flour and eggs in separate shallow bowls. 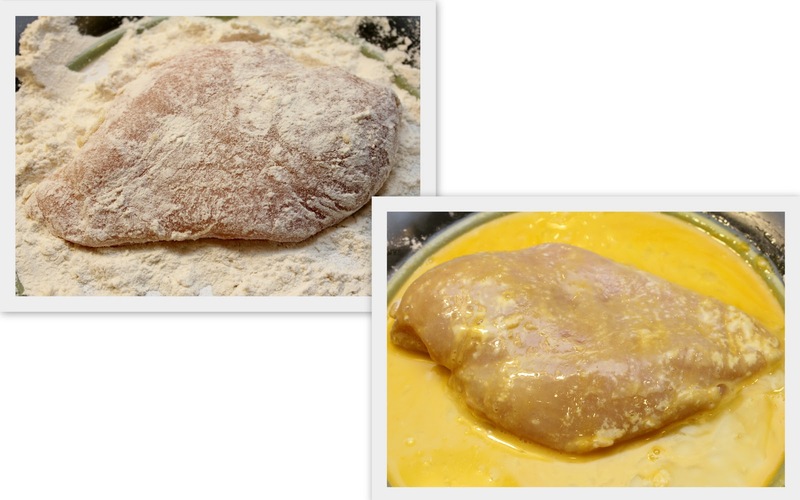 Dip chicken in flour, then in eggs; place in a greased 13 in. x 9 in. x 2 in. baking dish. Combine the Parmesan cheese, bread crumbs and butter. Sprinkle over chicken. Loosely cover baking dish with foil. Bake at 375 degrees for 20 minutes. Uncover; bake 5-10 minutes longer or until top is browned. Meanwhile, in a bowl, combine the remaining ingredients. Spoon over the chicken. Return to the oven for 3-5 minutes or until tomato mixture is heated through.